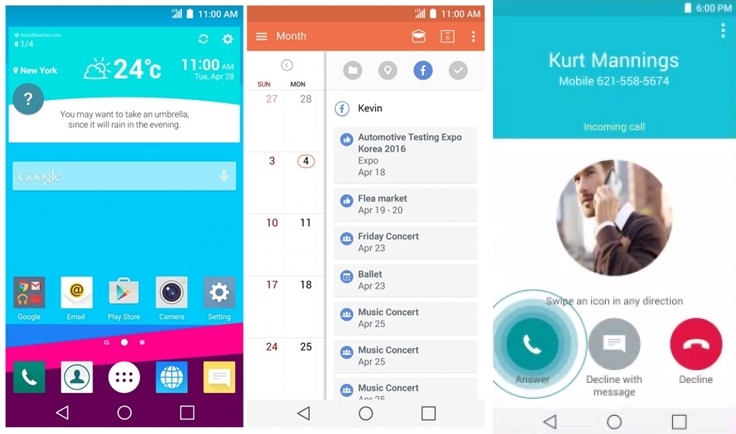 LG officially announced the release of its latest Android Interface. It is developed especially to support the new model LG G4, which is expected to the markets by the end of this month. The new interface has been named as LG UX 4.0. UX 4.0 is actually developed as a successor to its earlier versions of interface which started to be available with LG Optimus G. It was first made available in 2012. Recently LG officially has come out with a promo video showcasing the outstanding special features of the earlier versions of UX 4.0. The promo video lasts for about a minute. The first version showcased the feature of Quick Memo and QSlide. The second version came up with the features of KnockOn and KnockCode. The third one features the Gesture and Touch shooting options. Since all the three showcased something new always to the users, the fourth version is expected to feature something special. As anticipated latest version UX 4.0 also features something new. It comes out with features like Camera Manual Mode and also with Smart Notice. The camera of new LG G4 is developed in such a way that it proposes mainly three different modes – namely Simple, Basic, and Manual – before the customer. This will help the user to adjust the camera settings according to his skills. Simple Mode just provides the simple option of just point and shoot. But Manual Mode will give the opportunity of the full control on your camera settings. Smart Notice is another feature introduced in the fourth version. This is not really a new feature. It was already provided in the LG G3 model earlier. On seeing this one get easily remembers the Google Now application. Just like it, Smart Notice tracks your daily schedule and keeps trail of your journey plans. This will ultimately provide you with relevant and important data and information whenever you want. The new interface also features certain other innovations like more improved calendar, which allows the user to set reminders and informations about the event to which you are invited. This is done with the help of social networking websites in which you are active. Another feature is the all new Gallery, which allows the users to assemble photos based on the events in which they are taken and locations from where they are captured. When it comes to the handset, the LG G4 will have the option to tune unique and special ringtones each for your contacts separately. LG G4 hardware details are also available. It features a 5.5 inches QHD display. The Snapdragon 808 chipset powers the handset. The smartphone has a RAM of 3 GB, which will ensure its smooth functioning without any lag. The rear features to be 16 MP with 2160 pixel picture resolution. The front cam with 8 MP and 2160 pixels will be definitely admired by the selfie lovers. In all LG G4 features everything special including its Android interface and is expected to electronic markets by the end of April. Sadly no details regarding its pricing is not available till now.